FYI: "Avoir le cafard"note to have the cockroach is an idiom meaning "feeling depressed". Actor and singer Maurice Chevalier was the first French entertainer who became an international superstar after he moved to Hollywood. His fame and long career made him the most famous and easily recognized Frenchman of the 20th century. So, whenever comedians or even serious actors had to portray an archetypical Frenchman they imitated Chevalier's voice, which had a heavy French accent. A Stock Parody that is still in vogue today, even though most comedians and audiences have no idea where this stereotype originated from. The Maurice Chevalier accent is a typical Funny Foreigner subtrope, especially whenever a story is set in France. All these French characters talk in the same way: "the" and "this" are pronounced "zee" and "zis". The "w" is pronounced "ooweee". Some Gratuitous French words "mais oui", "sacrebleu", "zut alors", "mon ami" or "mon chéri" are used non-stop. There's often a grotesque emphasis on the final syllable of the last word in a sentence, for instance: "Zis is veiry importààààààànt!" Chevalier's iconic "hon hon hon" Signature Laugh has also become the standard way Frenchmen laugh in English-speaking fiction. Nowadays the Maurice Chevalier Accent will be used to voice every French character. In comedy and animation this can be amusing, but in serious stories it becomes Just a Stupid Accent and can really take you out of the story, because it literally becomes ridiculous Poirot Speak. In fact, whenever a comedic accent is needed you can rest assured that it will usually be French. It gets to the point of overkill. Sometimes, like in the movie Shrek (where the British character Robin Hood inexplicably speaks English with a French accentnote This may be explained by the fact that Robin Hood was a Norman), people are depicted as being French for no apparent reason other than evoking laughs while using the accent. The accent is a bit Truth in Television for most Frenchmen whose English is not yet that fluent, though everyone who tries to speak a language that isnt his own will have problems mastering it. Ironically enough even Maurice Chevalier himself lost his native accent after a while and sounded more like a normal English speaking man. Only in his early Hollywood years it was very rusty, but he also played it up for the microphone and cameras, because he was usually typecast as the archetypical Frenchman and thus had to sound like an "authentic" Frenchman who didn't speak English that fluently. Compare with Mock Cousteau, whenever a scene takes place under water. Although he cannot be heard, as this is the printed page, Batroc the Leaper is written with a thick "Frontch" accent, and has even reflected (in his own plainly written thought balloons) that he plays it up for effect. Louis the cook in The Little Mermaid. Lumière in Beauty and the Beast. Also note that that the entire story takes place in France and yet he's the only one speaking in this heavy French accent from the early twentieth century. The French dub of the movie rolls with this by keeping Lumière's accent but having everyone else use modern intonations. Prince Naveen in The Princess and the Frog, even though he's supposed to be from a fictional European country, and the few native words he uses sound closer to Italian than to French. The Genie in Aladdin plays a French waiter and typical Frenchmen near a romantic dinner, while using the accent. Shrek: Robin Hood, despite being an English folklore character, speaks with a French accent. In An American Tail: Fievel Goes West the French Cat in Cat R. Waul's gang speaks with an incredibly thick Chevalier accent. John Cleese as the French Taunter in Monty Python and the Holy Grail, despite the film taking place in an anachronistic but pre-Norman medieval England. Even Galahad asks him: "What are you doing in England?" Eric Idle during the title song, "The Meaning of Life" and the waiters in Monty Python's The Meaning of Life. Inspector Clouseau in The Pink Panther. The Marx Brothers, ocean liner stowaways in Monkey Business, each try to pass themselves off as Chevalier at the passport desk by singing - Harpo's sounds most accurate, thanks to the phonograph record he's lip synching to. The Red Shoes (1948): Some people speak actual French, other talk English with a grotesque French accent. In French Kiss, every single French character speaks this way. In particular, Luc (played by Kevin Kline) is all but doing an outright Maurice Chevalier imitation. French teacher Monsieur Leblanc on Our Miss Brooks. Likewise with any French character that appears on the show (or was heard in the radio version). John Cleese and Michael Palin in the "Flying Sheep" sketch in Monty Python's Flying Circus. 'Allo 'Allo! : All the French characters speak with this accent. During the "Everyday French with Pierre Escargot" segments on All That, Kenan Thompson would affect Maurice Chevalier's signature laugh. And that's pretty much the extent of the accent. Presenter Antoine de Caunes realised there was only one way to go when he presented spoof European-cultural show Eurotrash for British TV. In a show sending up the weirdest aspects of European pop culture for British viewers, with a French presenter note originally two French presenters, de Caunes seriously exaggerated his French accent to play up to the expectations of a British audience. Complete with the laugh. Averted by Captain Jean-Luc Picard in Star Trek: The Next Generation. The producers originally wanted the Captain to sound French but Patrick Stewart's attempts at a French accent came off as this. The producers then decided that a Captain's voice based on a comic actor was unsuitable for their series, and told Stewart to just use his trained RP accent (Stewart naturally - being a Yorkshireman — then had an Oop North accent). This accent was used in a recurring nasal-sounding voice from Bally and Williams machines in the latter half of the 90's. The most prominent usages are in Attack from Mars, as a Parisian bystander watching the Martians wreck the Eiffel Tower; and in Medieval Madness, as Elite Mook Francois du Grimm. Jacques le Roach, the French cockroach chef on The Animal Show, talks like this. Invoked in the pre-show warm-up for The Now Show 2017 Edinburgh Festival special (and probably other Now Show warm-ups). Steve and Hugh first explain that the sound guys need the audience to do a quiet laugh and a loud laugh, so they know what to expect and can get the mixing right. In order to make this more fun, they then suggest the audience do a pirate laugh. They then ask for the audience, without thinking about it or discussing it with each other, to do a French laugh. And almost everyone goes "Hon-he-hon-he-hon" in unison. During one of his early albums, Steve Martin mentioned going to Paris, without speaking a word of French. When the cab driver asked, in French, where he'd like to go, Steve tried adopting a French accent, "I would like to go to ze 'otel!" as if it would help. Disney Theme Parks: Pierre the French parrot briefly imitates Chevalier in The Enchanted Tiki Room. Randie's friend Jacques in Squid Row combines this with Funetik Aksent. Webcomic/Polandball: Franceball's laugh is usually portrayed as "Hon hon hon", but its actual way of speaking is more Poirot Speak like other non-anglophone countries. In the first videos of the Italian Webseries Insopportabilmente donna, Tess Masazza's French accent is quite prominent. Over time her Italian has quite improved. In the Mickey Mouse cartoon "Mickey's Gala Premier" (1933), Maurice Chevalier is one of the celebrities who welcomes Mickey by singing in his signature accent. Looney Tunes: Mel Blanc used this voice for many French (and even French-Canadian) characters, like the lumberjack in Wet Hare. However, Pepé Le Pew was based more on actor Charles Boyer's accent, although he does do a brief Chevalier imitation in "Scent-mental Romeo". The earliest Chevalier impressions can be found in the Merrie Melodies cartoons "Buddy's Show Boat" (1933) and "Shuffle Off To Buffalo" (1933). Jacques the bowling instructor in the episode "Life in the Fast Lane". The clumsy waiter in the episode "The Boy Who Knew Too Much". 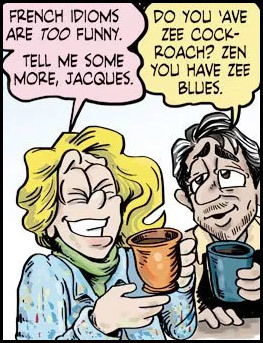 Jacques and Ugolin in "The Crepes of Wrath". In the "Treehouse of Horror VIII" segment, the French militaries who bomb Springfield all speak with a Maurice Chevalier accent and even conclude with a "hon hon hon" laugh. The French cook in "Guess Who's Coming To Criticize Dinner?" The French military officer in "The Trouble with Trillions". The West Springfield Elementary French teacher and his students in "Trilogy of Error". Class: HA HA HA HA HA HA! Class: HON HON HON HON HON HON! On The Huckleberry Hound Show, Daws Butler voiced Powerful Pierre in this way. The narrator on SpongeBob SquarePants, who is a reference to Jacques Cousteau. In some TV documentaries and news broadcasts, real-life French people are often dubbed while using Maurice Chevalier accents. This often comes across as comical instead of being serious. Certain French actors in English movies speak with this accent, including Jean Reno.